After playing guitar in his childhood, Motian began playing the drums at age 12, eventually touring New England in a swing band. During the Korean War he joined the Navy. 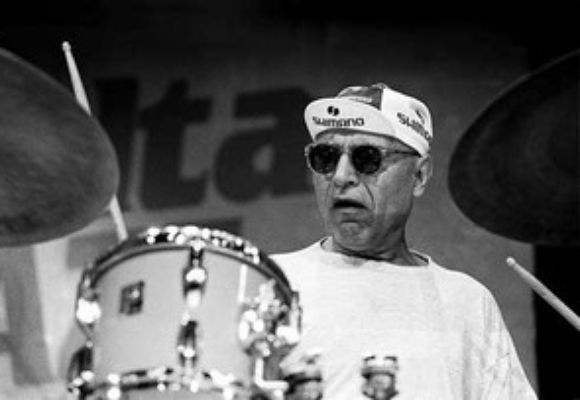 Motian has been a professional musician since 1954, and briefly played with pianist Thelonious Monk. He became well known as the drummer in pianist Bill Evans's trio (1959-64), initially alongside bassist Scott LaFaro and later Chuck Israels. Subsequently he has played with pianists Paul Bley (1963-4) and Keith Jarrett (1967-76). Other musicians with whom Motian performed and/or recorded in the early period of his career include Lennie Tristano, Warne Marsh, Joe Castro (musician), Arlo Guthrie (Motian performed briefly with Guthrie in 1968-69, and even performed with the singer at Woodstock), Carla Bley, Charlie Haden, and Don Cherry. As his career has continued, Motian has appeared with musicians such as Marilyn Crispell, Bill Frisell, Leni Stern, Joe Lovano, Alan Pasqua, Lee Konitz, Wolfgang Muthspiel, Bill McHenry, Stephane Oliva, and many more. Motian has also become an important composer and band-leader, recording initially for ECM Records in the 1970s and early 1980s and subsequently for Soul Note Records, JMT Records, and Winter & Winter Records, before returning to ECM in 2005. Since the early 1980s he has led a trio featuring guitarist Bill Frisell and saxophonist Joe Lovano, occasionally joined by bassists Ed Schuller, Charlie Haden or Marc Johnson, and other musicians, including Jim Pepper, Lee Konitz, Dewey Redman and Geri Allen. In addition to playing Motian's compositions, the group has recorded tributes to Thelonious Monk and Bill Evans, and a series of Paul Motian on Broadway albums, featuring original interpretations of standard tunes. Despite his important associations with pianists, Motian's work as a leader since the 1970s has been noteworthy for rarely including piano in his ensembles and relying heavily on guitar. Motian's first instrument was the guitar, and he seems to have retained an affinity for the instrument: in addition to his groups with Frisell, his first two solo albums on ECM featured Sam Brown, and he leads the "Electric Bebop Band", which features two and sometimes three electric guitars. The group was founded in the early 1990s, and has featured a variety of young guitar and saxophone players, in addition to electric bass and Motian's drums, including saxophonists Joshua Redman, Chris Potter, Chris Cheek, and Tony Malaby, and guitarists Kurt Rosenwinkel, Brad Shepik, Wolfgang Muthspiel, Steve Cardenas, Ben Monder, and Jakob Bro.